When asked to reflect on my time with the Firecrackers, because I was so young and it was so long ago, I drew a blank. After taking a minute to think about that time, however, I realize it was with the Firecrackers that I gained a lot of my softball knowledge and life lessons that I am still teaching to this day. 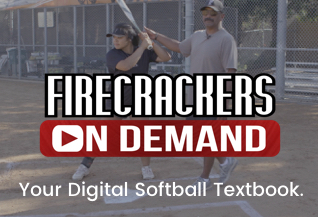 I realize my time with the Firecrackers is where I learned to play the game the right way. 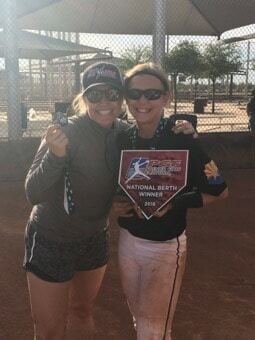 Softball is such a grind and can be so difficult, and the Firecrackers is where I learned to fight, I learned to compete, I learned to be a good teammate, I learned time management, I learned how to be a leader, I learned sacrifice, and very importantly, I learned what a good coach is. As an 8th and 9th grader, I was part of the Firecracker organization. Gary Wardein was our coach and Tony Rico was brought on early in his coaching career. We were somewhat learning together. He helped with hitters, but he also helped with the mental game. His demeanor was calming. He was never rattled and he calmly brought us through the ups and downs of a long season. He taught us how to be mentally tough and learn from our mistakes, but he did so without yelling. He had a quiet presence that you just didn’t want to disappoint. 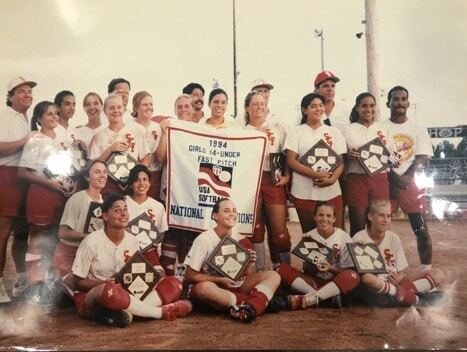 During our ASA Nationals in 1994, the equivalent of today’s PGF, our team came through the losers bracket to win 5 games on Sunday and become 14U National Champions. That accomplishment helped pave to way to greater things in my career and those of my teammates. I was fortunate to learn life lessons at such a young age that long, hot and humid Sunday. After making a very difficult decision to leave the Firecrackers in my Sophomore year, I joined Gordon’s Panthers (18U), a team made up of future collegiate All-Americans and future Olympians. I was well prepared because of my time with the Firecrackers, and the coaching of Gary Wardein and Tony Rico. As a Panther, I was fortunate to go on and win ASA Nationals in 1996 and 1998, losing only in 1997 to the Batbusters. All while my travel ball experience was going on, I was a student at Mater Dei High School (’94-’98), under the leadership of Doug Meyers. It was there where we put our grit and determination on display to win multiple CIF and State Championships, and we had so much fun doing it. Doug was the goofy one, who never took himself too seriously and would allow us to laugh through the process and have fun while doing so. He always had a smile on his face and jokes to tell and really lightened the mood practice after practice. It was a little more light hearted than travel ball, but we were every bit as determined. Thank goodness recruiting was different then than it is today, and, while I am thankful for the new NCAA recruiting rules, I know it will take some time to get back to the “good ol’ days.” After my junior year, I starting receiving recruiting letters from Division 1 softball programs throughout the country and narrowed down my visit choices shortly after our loss in the finals at Nationals in OKC. Having a sister who went to Ohio State University, I knew I wanted to leave California. I did take a recruiting trip to UCLA, but then it was off to Ohio State, Notre Dame, and Michigan. I was fortunate to have former teammates at all these schools, so I felt I was really able to make the best decision for my four years of academics, softball, and beyond. I chose Michigan and I am forever thankful they chose me. When I got to Ann Arbor, I was more than prepared because of the combination of my coaches and competition I had faced growing up. During my career at Michigan, we won the Big-Ten Championship 3 times, and participated in the WCWS twice. I was honored to receive several team and conference awards, and was selected to the All-American Team twice. The relationships I made during my time at Michigan and the coaching I received on and off the field was invaluable. To this day, I am still learning from Hutch!! As time passes, one might have to dig up the accolades and the championships, but what I don’t have to dig too deep to find, are the memories of my teammates, coaches, and the family we became. We all had a sense of naiveté that allowed us to develop at the proper pace, and we were out there because we loved the game and the people with whom we were surrounded. We were learning and doing things the right way. We were being taught to work harder, and not give up if we were unhappy. The coaches were trusted by the parents, who allowed the development to happen and not be forced to be “elite” at a young age. We were not chasing scholarships any longer; we were learning how to become good softball players who ended up doing great things. I now live in Phoenix, Arizona with JJ, my husband of 16 years. 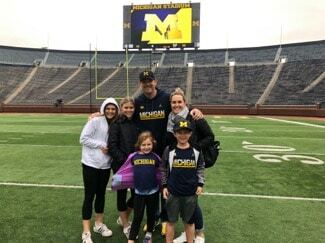 We have 4 children (13,13, 9, 7) who we are training to bleed Maize and Blue from the desert. My life has come full circle, because I am now coaching for Arizona Storm. I am hoping to instill every ounce of knowledge I have learned, through the phenomenal coaches I had, to my players. I am reteaching everything taught to me on and off the field, including hard work, be a good teammate, trust the process, love the game, work through the ups and downs, and have fun while doing it!! Softball has taught me so much and made me who I am today. I truly love being outside with the girls watching them improve. They are making similar memories that I made of my travel ball days, and it allows me to think fondly of my time playing softball.